Will the groundhog see his shadow? If the groundhog sees his shadow we have 6 more weeks of winter. If he doesn’t spring will be here soon! 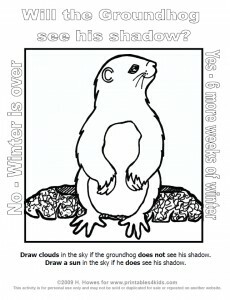 Print and color this groundhog day activity and make your own predictions! Click on the image above to view and print the Groundhog Activity and Coloring Sheet full size or download Groundhog Day Coloring Activity Sheet as a PDF file. You also need to visit our sister site, Celebrate-It.com for the cutest Groundhog cookies and more Groundhog Day activities. thank you so much for the groundhog pics- they are exactly what i was looking for! !